Taradale is a rural township on the Calder Highway, 17 km north-west of Kyneton. It is about the same distance south-east of Castlemaine, and is situated in a valley formed by the Back Creek near its junction with the Coliban River. Taradale was named after Tarradale, Scotland, the birthplace of the geologist Sir Roderick Murchison. The name was given by a colonial surveyor. 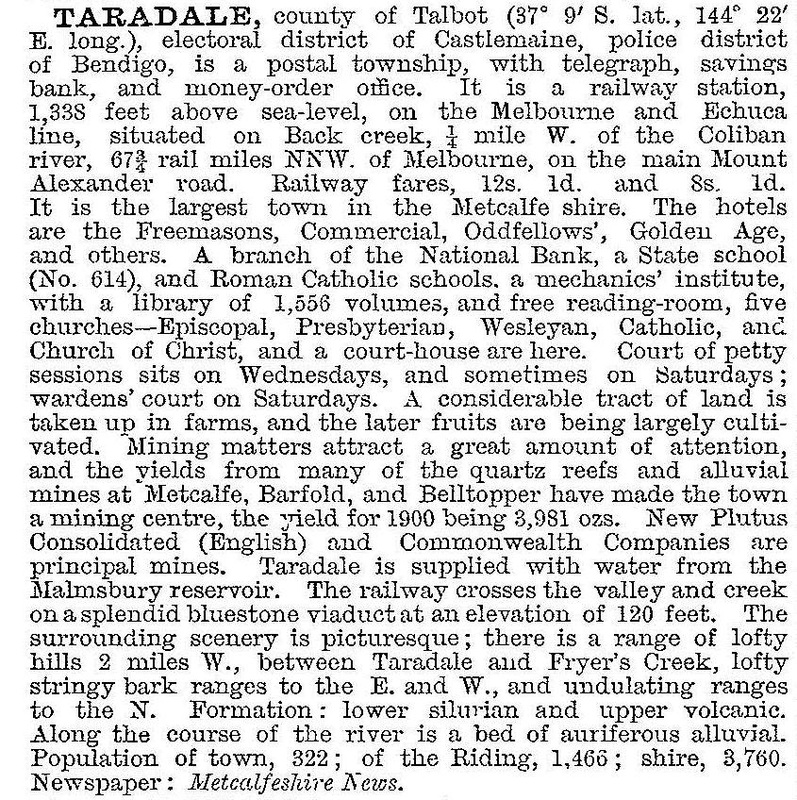 In 1852 gold deposits were found at Taradale, and payable deposits found at Back Creek and elsewhere in Taradale in 1856 resulted in a gold rush. They were part of the Coliban diggings running southwards to Lauriston. Further discoveries occurred, including reefs at Barfold, north-east of Taradale. Co-incident with the growth of mining Taradale underwent agricultural settlement. A school was opened in 1855, an Anglican church in 1856 and a mechanics’ institute in 1860. In 1862 the railway line from Kyneton to Bendigo was opened, involving the building of a viaduct bridge across the Back Creek valley. When built it was Australia’s longest metal girder bridge (198 m). It was supported by columns of massive bluestone blocks, 37 m high, since added to by intermediate steel-girder columns (1933) to support heavier locomotives. Shortly afterwards mining contracted, but revivals occurred in the 1930s and in 1956-57 at the once-richest Hughes/Achilles Reef. The Golden Gate mullock heap south of the township was the other principal site. Taradale’s location on the Calder Highway and its agricultural land have preserved it from fatal contraction. The town has also avoided the decay and loss of many historic buildings. Over 35 sites were identified in a heritage study for the Metcalfe shire and the railway station and viaduct bridge are on the Victorian Heritage Register.